iClassic is an iPod Classic simulator for the iPod Touch and iPhone that allows users to browse their music with the classic clickwheel found on the iPod Classic. It was released on Cydia for iOS 3, and was designed by Christian Baroni. An updated version optimized for iOS 12 was recently released on GitHub. 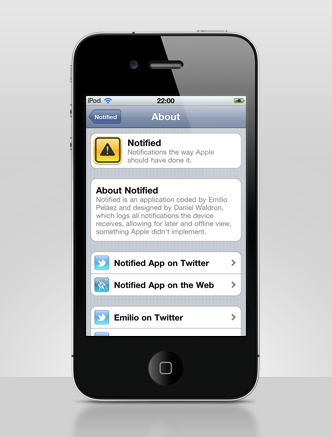 Notified was an iOS tweak designed to allow users review their past notifications, something which was unavailable at the time. It was released on Cydia in 2010, and the design was done by Daniel Waldron. Discourse was a simple English dictionary for iOS, designed to be fast and easy to use as well as good-looking. It used the Wordnik API to fetch definitions, synonyms and examples. Design was made by Mathieu White.